Rhun WilliamsBangor University has awarded its annual Llew Rees Memorial Prize to one of Wales’ up and coming rugby players. Rhun Williams, 18, from Pontrug near Caernarfon, has been awarded the prize as he has made the greatest contribution to raising the profile of Bangor University sport by his personal achievement at international level. As a first year student at the School of Sport, Health and Exercise Sciences, Rhun has had an incredible year which has seen him represent Wales Under 20s in the 2016 rugby six nations competition. “It has been a pleasure to watch him mature into the player and character he is today. 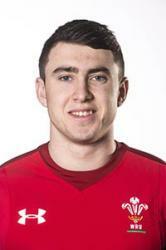 “For several years Rhun has been recognised as a very exciting prospect in the Welsh Rugby Union National Player Development Pathway, and in his time has been a key feature in the success achieved by Wales Under 18s at the International FIRA Championship, in which Rhun was awarded Player Of The Tournament. Rhun has recently secured a development contract with Cardiff Blues for the 2016/17 season.